Sunset Coach by Precision Miniatures first released their large scale diecast Professional Cars line in 2005. Since than, the recession has hit the diecast market hard and Precision Miniatures has become one of the casualties. These top quality, highly detailed replicas in 1:18 scale have aready gone up considerably in value as the models become more and more difficult to find. Features: Finely detailed inside and out, removable wood grain casket with chrome handles, separate Church Truck for casket, opening rear door for removing casket, opening driver and passenger doors, high gloss paint, extending rear service table for casket and detailed wood grain rear compartment. Original retail price was $90.00.Now you can expect to pay in the $250 to $400 range. Can sometimes be found on eBay . 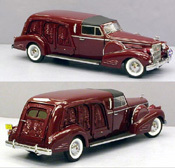 Features: Same fine detailing and features as the Landau above, also with removable wood grain casket with chrome handles, separate Church Truck for casket and extending rear service table.Oening rear door for removing casket, opening driver and passenger doors and high gloss paint, The original retail price was $90.00. Now you can expect to pay in the $250 to $400 range. Can sometimes be found on eBay . Features: Finely detailed inside and out, removable wood grain casket with chrome handles, separate Church Truck for casket, opening upward rear section for removing casket, opening driver and passenger doors, high gloss paint and chrome racks-bed for flowers. Original retail price was $90.00. Now you can expect to pay in the $250 to $400 range. Can only rarely be found on eBay . 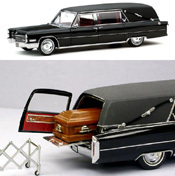 Features: Finely detailed inside and out, removable wood grain casket with chrome handles, separate Church Truck for casket, opening rear door for removing casket, opening driver and passenger doors, high gloss paint, extending rear service table for casket and detailed wood grain rear compartment. Original retail price was $119.00. Now you can expect to pay in the $250 to $400 range. Can sometimes be found on eBay . 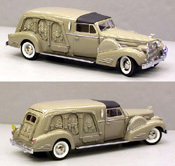 Features: Same fine detailing and features as the Landau above, also with removable wood grain casket with chrome handles, separate Church Truck for casket and extending rear service table for casket. The original retail price was $119.00. Now you can expect to pay in the $250 to $400 range. Can sometimes be found on eBay . Features: Precisely detailed inside and out, removable wood grain casket with chrome handles, separate Church Truck for casket, opening rear door for removing casket, opening driver and passenger doors, high gloss paint, extending rear service table for casket, removable drivers compartment roof and detailed wood grain rear compartment. The original retail price was $109.00. Can rarely, be found on eBay for 3-4 times that. Also available (not by Precision Miniatures) in 1:32 scale in Black with opening front doors and rear loading door, wood grain rear compartment, and removable wood grain casket with chrome handles. Not bad detail for this scale but hard to find. Try eBay .